At the present time to find and put new doors to replace the old snap – such a product in any shop of building materials and the mass of the carpentry workshops. And yet many people try not to replace but to upgrade, enjoy participating in the creative process to create creative things. If such a thought came to you, be creative and try, you might discover an exciting new world. To change the appearance of your door, you have to learn some skills working with wood, tiles, glass, etc., depending on what was done to your door. But first think about what style you want to make it, because it should harmonize with the interior. 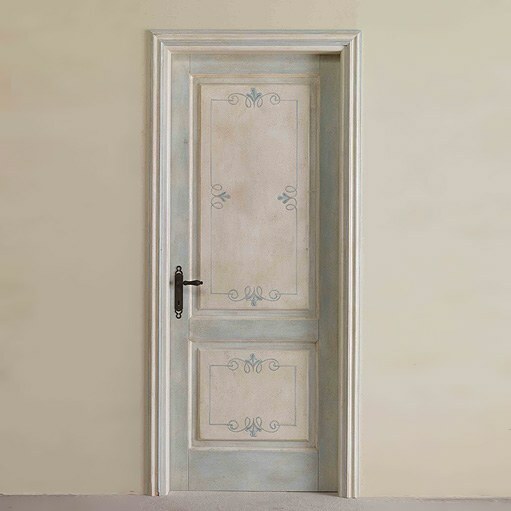 If we are talking about the front door, from the outside it can be painted, varnished, lined with laminate, plastic, obbit artificial leather, imitation leather or thin wooden slats. Strips of various lengths can be laid out a beautiful pattern that will look strange on the background of other, more boring doors in your entrance. But this should try this pattern to come up with and assemble. Strap can be put on liquid nails or gently beat carnations. If you wish, you can look for ready-made furniture – carved details (or even forged metal) that you can also decorate your door. The inner side of the door can also be painted and to cover some material, pasted with self-adhesive, non-woven wall murals or Wallpaper. Other types of Wallpaper on the door gluing is undesirable because they are not as resistant and prone to various mechanical damage. Before painting or pasting the door carefully clean off the old paint, align the sandpaper zashpaklyuyte cracks and other damages, if any, and programsuite surface. Decorate an old door: to fold and glue the pattern of the veneer; cut a stencil pattern and apply the pattern with paint; hang a garland or a wreath of artificial fir branches, flowers, bows, hearts, pendants; attach an amulet from clay or aluminum tube, emits a melodic ringing. Interior door also can decorate a variety of ways. Decorate with a mosaic of veneer. Attach a flexible plastic mirror, and his finished carved details. Draw the patterns on the doors with stencils and aerosol. Order from the artist to some dear to your heart landscape or view, and the edge of the picture-the doors make a baguette. Paint the door in the desired color Foundation coat it with glue and then gold leaf. When the glue dries, remove the excess gold and varnish surface. Make a door in vintage style. To do this, collect different pieces of glass, mirror, tile fragments, shells, flat stones, etc. all Apply it randomly on the door and paint. Laminate family photos, interesting city views, landscapes, etc. Paint the door in the main tone; then draw rectangles of other shades that attach your photos. On top of all paint. If your interior door has glass, you can replace it with a matte, smoky, patterned or stained glass to make a pseudo – or even real, with bevelled glass. On the glass, apply the prints of old paintings or engravings. And instead of one glass try to insert in your door two thin, and between them lay a beautiful cloth or lace doilies, purchased or personally related. All that you do should be done very carefully, matching in color and style with your room and its furnishings. It is also good if your product will present a sense of proportion and artistic taste. Remember: to bring to mind an old door, you have to spend a lot of time, effort and money.